•	149mm x 149mm maximum writing area. •	155mm x 155mm x 7mm maximum wafer size. •	1µm resolution across full writing area. •	405nm long-life semiconductor lightsource (385nm available as option). •	Fast writing speed: up to 20mm2/minute writing speed (1µm resolution), allowing a 50mm x 50mm area to be exposed in approximately 2 hours. •	Autofocus system using yellow light – no minimum wafer size. •	High quality optical microscope camera with Olympus infinite conjugate x10 plan objective lens and yellow light illumination for alignment to lithographic markers on the wafer (±2µm 3σ alignment accuracy). Additional x4 digital zoom can be selected in software. •	Grey scale exposure mode for 3-dimensional patterning (255 grey levels). •	Software API for external interfacing and control. •	0.2µm minimum addressable grid; 20nm minimum sample stage step size. •	Acceptable file formats: CIF, BMP, TIFF. •	External dimensions: 700mm (w) x 700mm (d) x 700m (h), excluding computer. •	Light-excluding enclosure with safety interlock. •	Designed for desktop use – no optical table required. •	Easy to use, Windows® based control software supplied. •	Supplied with pre-configured 64-bit Windows® 10 PC and monitor for ‘plug and play’ installation. •	Extremely competitively priced for University and industrial R&D budgets. •	Can be upgraded for higher performance. •	195mm x 195mm maximum writing area. •	230mm x 230mm x 15mm maximum wafer size. •	0.6µm, 1µm, 2µm and 5µm resolutions across full writing area. •	Automatic selection of resolution via software – no manual changing of lens required. •	385nm long-life semiconductor light source, suitable for broadband, g-, h- and i-line positive and negative photoresists, including SU-8. •	Extremely fast writing speed – up to: 20mm2/minute (0.6µm resolution), 50mm2/minute (1µm resolution), 100mm2/minute (2µm resolution) and 180mm2/minute (5µm resolution). These allow a typical 50mm x 50mm area combining critical and non-critical areas to be exposed in under 30 minutes or a 100mm x 100mm area to be fully exposed at 2µm resolution in under 2 hours. •	Autofocus system using yellow light which automatically tracks surface height variation during exposure, compensating for bowed or inclined substrates and surfaces with highly irregular topography. No minimum wafer size. •	High quality infinite conjugate optical microscope camera with x3 aspheric objective lens and x5, x10 and x20 Olympus plan achromatic objective lens and yellow light illumination for alignment to lithographic markers on the wafer (±0.5µm 3σ alignment accuracy). •	Automatic changing between microscope magnifications via software – no manual changing of lens required. Additional x4 digital zoom can be selected in software. •	100nm minimum addressable grid; 20nm minimum sample stage step size. •	Acceptable file formats: CIF, BMP, TIFF and (via Clewin 5) GDSII. 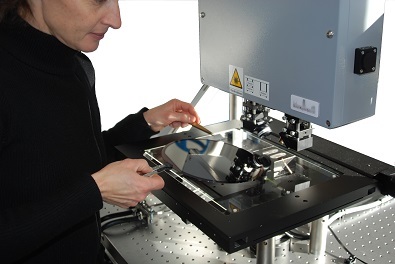 •	Built-in 2-dimensional optical surface profiler (100nm thickness resolution) for examining exposed resists, deposited layers, etching and other MEMS process steps. •	Automatic wafer inspection tool allowing each die on a wafer to be imaged. 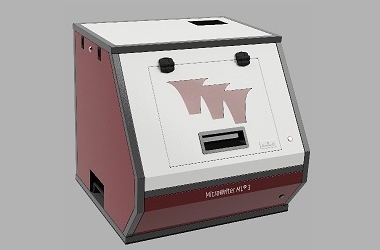 •	Virtual mask aligner mode in which the pattern to be exposed is displayed on top of the real-time microscope image, allowing the machine to be used like a traditional mask aligner. 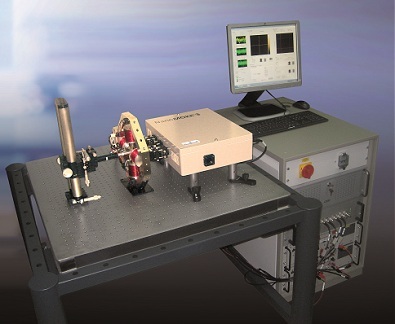 •	Includes passive vibration-isolation optical table. •	Supplied with Clewin 5 mask design software. •	Supplied with pre-configured 64-bit Windows® 10 PC with monitor, keyboard and mouse. •	Includes on-site installation by trained service technician. •	90-260 VAC, 50-60Hz, 4A single phase power requirement. •	CE-marked and compliant with EN-61010.